Following the unsatisfactory experience with the apodizing filter I decided to try to create my own filter that would have the advantages of the apodizing filter without the disadvantages. The first step was to analyze the old linear and new apodizing filters. I started out looking for software that can analyze filters, but did not find anything besides the software that Ayre also uses (QEDesign2000). That seems to be able to load filter coefficients, but the file format is not documented (there are no docs at all) and the company did not respond to my question about it. So I decided to write something myself that can both analyze and generate filters. Let’s first take a look at the impulse response of the filters, as John Atkinson also did in his review of the 808.2. The difference is pretty clear: the new filter does not have a pre-echo, but has a much bigger post-echo. This is supposed to be one of the main advantages. 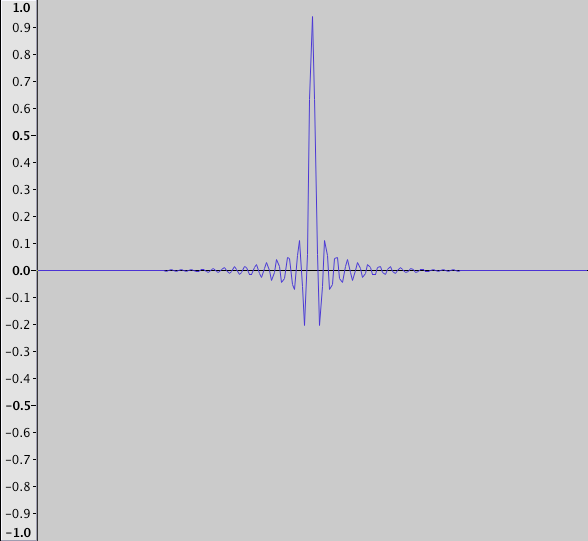 Pre-echos are not natural (there is nothing that ‘announces’ a sound), post-echos are natural (reverberation). The bigger post-echo should be no problem because the cycles are lower than the impulse and the masking effect of the ear will hide them. Meridian is using the term ‘apodizing’ to indicate the removal of the pre-echo (which resides at the nyquist frequency of 22.05kHz) and side-effects caused by brick-wall filters from the original recording. Apodizing itself means a gradual falloff, and is the way the above is accomplished: we see that the amplitude gradually decreases to -100dB from 20kHz to 22kHz. But now comes the interesting part: also the old linear filters has this apodizing falloff! Apodizing is thus not the discriminating feature of the new filter! The difference between the old and new filters is clearly not in the amplitude response, but in the phase behavior: the old filter is linear to 22kHz, but the new filter has a gradually increasing phase shift that increases with the frequency. This is caused by the minimal phase behavior of the filter. Although the resolution of the picture is not high enough to see, the phase shift starts already from the lowest frequency and increases more as the frequency goes up (logarithmic). So the absence of the pre-echo comes at the cost of an increasing phase shift across the entire frequency range. People may argue that the shift is only small, and this may be good enough for normal audio applications, but for high-end it seems a serious issue. For one the human brain uses phase information of frequencies up to 3kHz for spacial localization. The inner ear itself has an amplification around 3kHz, which makes the ear most sensitive in the 2 to 5 kHz range (for human speech). And the most important one, instruments and voices are not just limited to a single frequency, they operate on a range. For instance drums even operate on the entire range from low to high. Every frequency component of the sound will get a different shift in time with this filter, it is like smearing the sound over the frequency range, with lows first and highs last. This might also explain why the lows are more pronounced. On the HitchHikers forum it is mentioned countless times that there is (must be?) a special sauce in the Meridian filter. However, from this analysis there is no indication that this is the case. The old linear filter is just an equiripple lowpass filter, and the new apodizing filter is a minimal phase version of this linear filter. With a bit of Googling you can find a mathlab script to convert a linear filter into a minimal phase filter. This entry was posted in Meridian. Bookmark the permalink. Maybe it is a question of the phase graph scale but at a first glance it looks like the apodizing filter has pretty linear phase response in the passband so the question is whether it is not a somehow modified version of a simple minimum-phase filter ? Pass-band phase behaviour is all that counts actually. 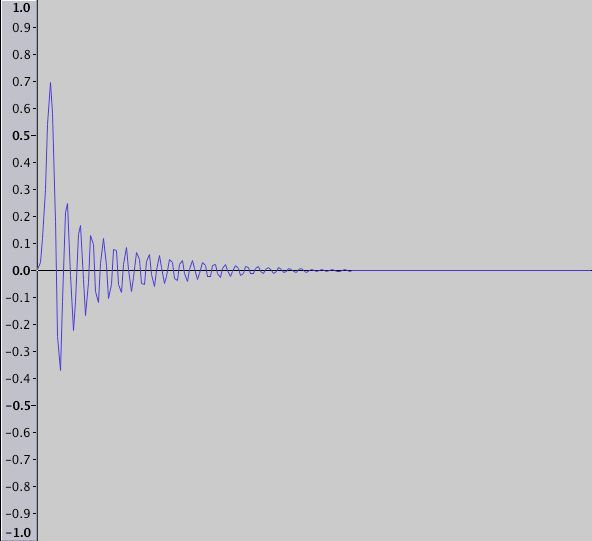 It looks pretty linear, but that is because of the scale of the phase response picture. If you would zoom in you can see that the curve continues. Now of course this still seems like a small phase shift, but in my experience it makes a big difference. Ok, I am not surprised at all that Meridian’s filter is a simple minimum-phase version of the symmetrical FIR. But in my well-grounded experience the pre-echo is quite audible, I do not know yet about the linear phase impact because the two things are interrelated unfortunately. What is missing is an idea how to generate a linear-phase, no-pre-echo filter – if I understood well you intended to create one – have you succeeded with it ? It would be interesting to listen and compare, I have good possibliites to do it on my hi-fi setup. BTW, Matlab is a very good tool for analyzing such things around filters. I have seen on other pages of your website that in your view both pre-echo and post-echo are equally bad so best is not to have any xover filters. Bu then how can it be achievable withthe current speaker drivers technology and especially risk of damaging the tweeter ? Full-range drivers ? – what about beaming and low bass then ? Filters are especially bad in 1x sampling range (44.1 and 48kHz), because the side-effects are in the hearable range. The commonly used brick wall filters used in recording to filter around the Nyquist frequency of 22.05kHz are notorious sound quality killers. Filters executed in higher sampling ranges still have the same side-effects, but far above the (humanly) audible range. That is the reason why Meridian first up samples the input to 2x and then performs Trifield, bass-management and room correction in the surround processor. Also the cross-over in DSP speakers is done at 2x. Upsampling by enabling milder filters might help reduce ringing if that applies to the recording process and I rather thought the discussion was about the playback side ? For xovers it is not true. I would point out that ringing actually a time-domain phenomenon and if you look for instance at Matlab simulations of FIR filters you will easily find out that you gain exactly null in the case of crossover filtering in an upsampled domain if you finally want to achieve the same filtering parameters. The net effect is that it is actually -more difficult- to implement and execute a xover filter at a particular low-range frequency in upsampled domains. Actually that statement is based on the theory of Peter Craven and Bob Stuart, that the “side-effects” of pre- and post echo are noticeable around the Nyquist frequency. This theory is the central idea for their apodizing filter. I am not familiar with this theory but especially Peter Craven is a well-respected audio reseracher – can you paste some references to the theory ? But even the fact that there are frequency-domain artifacts caused by ringing does not mean that this the most important audible sensation caused by this. Especially realtively mioe effects near to the Nyquist frequency of 20kHz for CD which is the threshold of human hearing, Seems rather unlikely . Our auditory system is more tuned to temporal stimuli than frequency-related, And what especially pre-response does is destroying sound envelope – especially the more important attack – which is typically in music literatur considered more important to the perceived sound character than exact harmonical content. Hi, I measure and optimize audio systems professionally using dual channel fft measurement and have designed a few filters. Transducers all exhibhit phase shift across their passband, sometimes hundreds of degrees across a full range system. So unless you’re going to listen to that music via telepathy, the rising phase response approaching measurement Nyquist on the apodized filter is negligible. As a matter of fact, it more closely fits a linear function . IMO The apodized filter is preferable. It will not suffer from phase shift stacking with filters up or down stream. Yes, the apodizing filter is close to linear, but not quite. And yes, you would think that you are not able to hear this. But you are completely wrong, the difference is crystal clear. The filter I designed, which is linear below 10kHz and minimal phase above 10kHz, proofs this. And don’t take my word on it, just read the customer comments in other posts on my blog. It appears that humans are extremely sensitive below 10kHz. Even Meridian acknowledges this, because they specifically engineered a lowpass filter for their ‘folding’ downsample filter for MQA to make sure they do not change the lowest 10kHz of the signal. MQA – What is Meridian hiding?